Mark of Kaine. Photo: Bill Clark/CQ-Roll Call,Inc. Specifically, they’re prepared to show voters that it’s still possible for lawmakers to put aside their differences, and work together to help banks discriminate against black people, coerce mobile-home buyers into predatory loans, and pursue high-risk lending strategies that increase the likelihood of a future financial crisis. Of course, the bill’s proponents wouldn’t characterize their aims in those terms. The legislation’s official purpose is to make “targeted, common sense fixes” to banking regulations, so as to “provide tangible relief to community banks and credit unions, while leaving in place the rules and regulations that keep Wall Street accountable.” This might be an honest description of Senate Democrats’ initial aspirations for a banking bill, but it is a transparently false summary of the actual legislation before the upper chamber this week. When Congress saved Wall Street’s skin in 2009, it asked for (shamefully) little in return. But lawmakers did, at least, require all big banks — which is to say, all banks that held at least $50 billion in assets — to maintain larger capital reserves, undergo “stress tests” (simulations that demonstrate a bank’s capacity to survive a crisis without Uncle Sam’s help), and comply with heightened risk-management standards. But the legislation before the Senate this week, known as the Crapo bill (after its primary author, Republican senator Mike Crapo), would raise that threshold to $250 billion. This change would not provide “targeted” relief to community banks; rather, it would free 25 of America’s 38 largest lenders from enhanced regulatory scrutiny. Such medium-sized banks are big enough to lend their names to NFL stadiums — and, more importantly, to jeopardize the entire financial system, should they collapse. When Countrywide was America’s largest subprime lender — and originating roughly 20 percent of all mortgages in the United States — it claimed “only” $200 billion in assets. And it was one of multiple similarly sized firms whose failure posed a systemic risk to the economy ten years ago. “The last crisis proved that three banks in the $100 to $250 [billion] range were shown to be systemic, because regulators had to arrange a quick emergency bailout or sale,” Arthur Wilmarth, law professor at George Washington University, told the Intercept this week. In total, the banks that would benefit from the Senate bill required $47 billion in direct bailout funds after the 2008 crisis. Elizabeth Warren, Bernie Sanders, and every Senate Democrat with 2020 ambitions has argued that raising the threshold for enhanced regulatory scrutiny to $250 billion would jeopardize the global financial system. But one doesn’t need to be a progressive politician to reach that conclusion: Warren’s archnemesis in the Obama Treasury Department, Antonio Weiss, and former Federal Reserve Chair (and nemesis of the working class) Paul Volcker have both condemned the measure as unacceptably dangerous. Meanwhile, the nonpartisan Congressional Budget Office concluded this week that the Crapo bill would significantly increase the odds that taxpayers will need to bail out a failed bank in the near future. The 12 Democrats who are about to give Mitch McConnell a filibuster-proof majority for gutting Dodd-Frank say they are doing so to strengthen small lenders. But the bill they’re supporting won’t reduce consolidation in the financial sector, it will actively promote it: Right now, there are a lot of medium-sized banks that would love to gobble up smaller ones — but aren’t doing so, because they want to avoid the regulatory scrutiny that would come from amassing more than $50 billion in assets. Thus, once this law goes through, a wave of banking mergers (that will reduce the number of community banks in the U.S.) is likely to follow. The “pro-deregulation” Democrats’ rhetoric would lead one to believe that they don’t understand this; but their financial disclosures suggest they might understand all too well: According to the Financial Times, the 12 Democrats behind the Crapo bill derive an unusually high percentage of their campaign donations from banks with just under $50 billion in assets. Now, it is true that the Crapo bill also includes some measures that would genuinely benefit small lenders — but many of those benefits come at the expense of consumers. One of the bill’s provisions would empower community banks to issue subprime loans without having to produce evidence that borrowers are likely to pay them back. Adam Levitin, former adviser to the Consumer Financial Protection Bureau, believes that this will incentivize community banks to issue loads of highly risky (but potentially, highly profitable) subprime loans — and, thus, set both themselves and their customers up for financial devastation, should the economy suddenly turn south. A separate provision of the bill would make it easier for community banks to discriminate against racial minorities. Lenders still routinely deny loans to African-Americans who should merit them, on the basis of their wealth and income. Such predation was especially rampant in the lead-up to the financial crisis, when loan officers at Wells Fargo regularly pushed black clients — or, as they referred to them, “mud people” — to take out subprime loans, even when their credit histories qualified them for prime ones. To combat such abuse, Dodd-Frank required lenders to report information about their housing loan practices that would make discriminatory lending easier to spot and prosecute. By forcing banks to pony up their borrowers’ credit scores, debt-to-income ratios, and other data, regulators could see when banks were systematically treating equally creditworthy borrowers differently, on the ostensible basis of race. 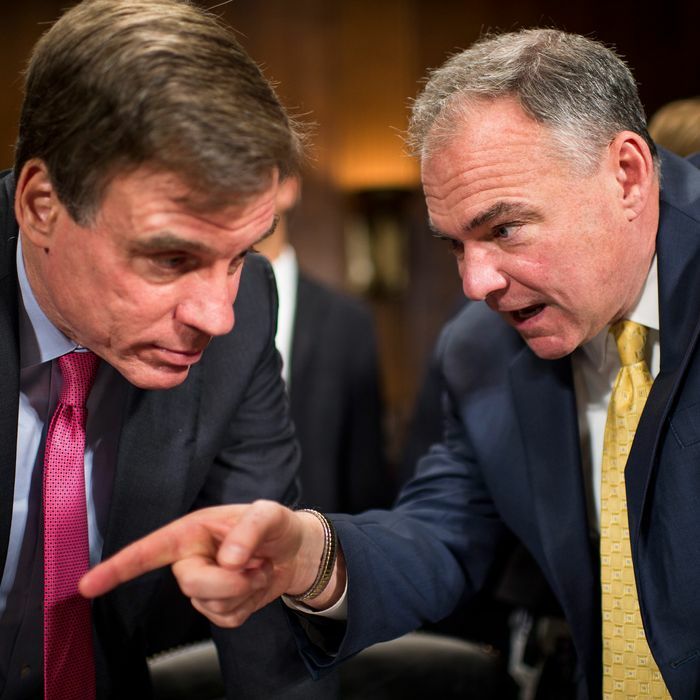 The bill that 12 Senate Democrats are about to vote for — including Tim Kaine, who portrayed himself as a stalwart opponent of housing discrimination on the campaign trail in 2016 — would exempt 85 percent of American banks and credit unions from having to provide such information. Meanwhile, the bill would empower lenders to exploit consumers across the racial divide, by enabling sellers of mobile homes in (often white) rural areas to steer their consumers to high-cost loans, even when said consumers qualify for less-expensive forms of financing. … The problem, Senate staffers said, is that there’s no private right of action for any of these protections. Since Congress enabled arbitration clauses to bar the ability for financial consumers to band together in class action lawsuits, that leaves government enforcement. And under Trump, such enforcement doesn’t exist. In fact, under acting Director Mick Mulvaney, the CFPB has taken up no new enforcement actions at all. All of this raises the question: Why are Democrats supporting this thing? It’s true that several of the senators in question are facing tough reelection bids in Trump states this November. But are there really a significant number of voters in Montana who will forgive Jon Tester for voting against tax cuts and Obamacare repeal — but turn against him because he refused to help mobile-home retailers exploit their customers? And are there really a significant number of voters in the state of North Dakota who care passionately about exempting community banks from the Home Mortgage Disclosure Act’s reporting requirements? Even if we stipulate that Heidi Heitkamp and Jon Tester need to establish their bipartisan bona fides by any means necessary, why are safe, blue-state incumbents like Tim Kaine and Mark Warner backing this monstrosity? It’s hard to argue that the bill’s flaws are an acceptable price for delivering much-needed relief to community banks, when there’s scant evidence that such banks require any relief, at all: As of late 2017, 96 percent of America’s community banks were profitable, and a high percentage of those were posting record-high profits. Alas, the most plausible explanation for the Democrats’ capitulation is the vulgar Marxist one: We’re living through an era of peak partisan polarization — and record corporate spending on lobbying and campaigns. The former reality has made it impossible for the Senate to pass immigration and gun control reforms, despite broad public support for bipartisan bills on both issues; the latter has made it easy for the Senate to deliver bipartisan gifts to their Wall Street benefactors, despite broad public opposition. And the dismal condition of our Fourth Estate just might allow these mercenary “moderates” to frame their feat of cooperative corruption as proof that our political system isn’t broken.